The risk of footballers dying because their heart stops beating is higher than experts thought, a study suggests. There have been high-profile deaths, including that of Marc-Vivien Foe while playing for Cameroon aged 28. Former England defender Ugo Ehiogu, who was a Spurs coach, died last year aged 44. The study, in the New England Journal of Medicine, comes from two decades of data on 11,168 youth players in the UK. Doctors said there was a duty to protect players. Diseases that affect the heart muscle – cardiomyopathies – are silent killers. The first symptom can be the heart suddenly stopping. This is why clubs have a screening programme for academy players at age 16. The dangers are higher in elite athletes because taxing the heart can trigger their underlying disease. Adrenaline, changes in electrolytes and dehydration all increase the risk of triggering a cardiac arrest. But nobody was certain how common deaths from a cardiac arrest were. Estimates had put the figure at less than two in every 100,000 players but this analysis says the figure is higher – seven in every 100,000 players. In 20 years of screening, 42 academy prospects were found to be at risk. Treatments – including corrective surgery and heart drugs – meant 30 could resume their careers. The rest were advised to stop playing competitive sport. But the screening was not perfect. It missed Bolton player Fabrice Muamba, who survived after his heart stopped and he collapsed during an FA Cup match. Doctors said Fabrice Muamba “died for 78 minutes” after his heart stopped. And of the eight players who died during the study, only six had been diagnosed with a heart problem as a result of screening. Prof Sharma said England’s Football Association had already introduced additional screening at ages 18, 20 and 25. He said identifying an untreatable heart problem could be hard for young players and decisions had to be made between the player, their parents and their club. He said: “It’s very difficult for a young kid who’s dreamt of this and has done nothing but play football since the age of eight or nine. “We have to be extremely honest and say there is a risk of sudden death and the death rate is low but we can’t predict it. Dr Zaf Iqbal, a doctor with Crystal Palace Football Club, told the BBC: “In every Premier League game, there always has to be a doctor on each bench, two paramedics and mandatory equipment. As well as the screening programme, he said, the club had defibrillators – which deliver an electric shot to the heart – on the training ground and coaching staff had been trained to use them. “The thing that will save these guys is a defibrillator,” he said. 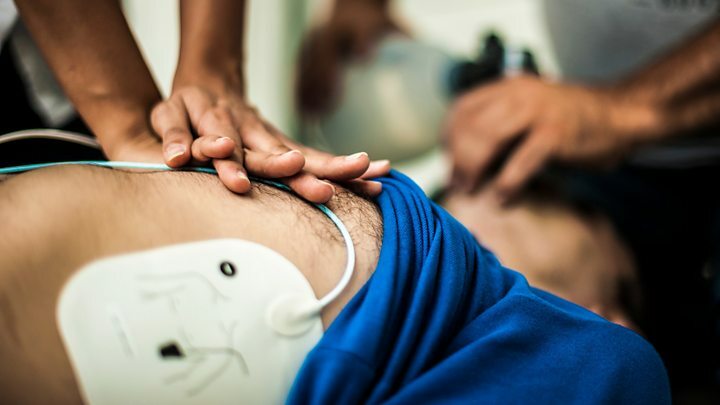 The FA said it had one of the most comprehensive heart-screening programmes in sport and offered emergency training to medical teams at professional clubs.